If employee burnout is not one of your top priorities, then it should be. Especially when your company is expanding. A growing company means more demands, more work, more hours, more stress and less time to relax. All of this combined can be very damaging, and not just for the individual but also for the whole company too. You need to be especially wary in periods when your company is growing so that you don’t lose track of your employees and overlook some clear warning signs of burnout. In this article I’ve highlight a few ways some of the biggest companies are looking after their employees and what you can take away from them; we’ve all heard about the perks of Google, but do you know what Buzzfeed offers its workforce? First, lets start with identifying burnout. You might have noticed an employee or a colleague arriving to work after you drank your first coffee and leaving before everyone else starts packing their bags. This employee could also be you, so this article might give you a few ideas to talk to your boss about to help you get out of that rut. If you’re a manager and have noticed any of these 5 symptoms (self diagnosis is OK) in your employees you should read on to find out what to do to avoid disaster in your company – because burnout DOES spread. No engagement; Your employees are not jumping on board with your ideas or vision and are not contributing any ideas of their own. High stress levels; It’s not rocket science, you can see an anxious person from a mile away and finger nail biting is just the first warning sign. Physical illness is also related to stress, and you might notice someone taking consistent sick leave, which is a way the body is saying to someone to stop. Negativity; Are your employees showing a lot of negativity? Self-criticism also falls into this observation, when an employee continuously states that they cannot do tasks because they’re not good at it, you should know something is going wrong. No breaks; Is everyone taking breaks when they should? Having a mental break from the computer screen is essential for people to function better. Procrastination; When you see that your employees are not focusing on their work and go the long way to avoid tasks you know there is an issue. Might be difficult to identify if you work with freelancers, but you can measure task completion productivity in the same way. Noticing these small details will help you identify on what area you need to improve and create a better work culture to push your company forward. Even though burnout in the workplace is a very common issue, many managers don’t know why it happens or how to deal with it. Before I get to some excellent examples of companies attempting to prevent burnout, you should first understand why it can happen. Here is my breakdown of each factor that contributes to burnout. If I missed a crucial one let me know in the comments section below! No Support – Employees look towards their manager for support. You can give them mountains of work to complete but without personal and practical support you will find them losing motivation fast. Kevin Daum is right to say that that you should not multi task when having a conversation with someone, because divided attention seems like you don’t care enough. Demands – It’s hard to get the balance right with this one. On one hand giving too many tasks to do in a day will over work your team, but having too little will give make a very unproductive environment. For overworked writers you should think about getting a content calendar to help with the demands of the job. No Feedback – People that work hard on a project like to get feedback and you should not skip this step, even if it is criticism. Saying something is better than not saying anything at all. Just remember the feedback sandwich (Here is a How-To) that helps you deliver critical advice. Role Ambiguity – With every employee they should know what their role is, if there is no direction in the role there will be no direction in the work output. That doesn’t mean it can’t change, when your company is growing this is inevitable, you just have to keep your employees informed when it does change. No Resources – For any employee to feel like they can do their task to a high standard you need to provide them with the tools for it. Whether it’s investing in newer software or sending them for specific skill building courses, your investment will increase productivity. Coursera has a lot of free courses that could help grow your business (like High Impact Business Writing), why not set up a learning hour? Read on to find out how Google encourages learning in the workplace. These are just 5 reasons, for every work place they will be different depending on the environment. I scoured the web to find the best solutions for employee burnout from some of the world’s most successful companies. I know that not every company can replicate the exact same work policy, but even if you take segments away to your departments you will see happier employees and better output. For example, at imonomy we do our best to keep our growing team stay close by organizing many social events throughout the month. In many countries the number of vacation days are very slim, and especially as this factor has such a high impact on employee moral it is important to get it right. Last year Richard Branson announced a new policy for all Virgin employees, unlimited paid vacation days. Though it may sound over the top, this actually works at promoting a productive atmosphere rather than a number counting one. Virgin are not the only company that adopted this approach; Hubspot, Evernote, NetFlix and Groupon employees also have this benefit. You don’t have to worry about being this strategy being abused, 1/3 of all Americans don’t take their total holiday entitlement even when they don’t have this extra benefit. Lesson learned: Don’t make your employees stress about taking time off. The more relaxed they are the better it is for their work efficiency and job satisfaction. If you don’t want to go broadcasting this strategy so that people don’t take advantage, you can also deliver it through being open and understanding when your employee requests a well needed holiday. If they ask for one week, say why don’t you have two? If you are lucky enough to work for Vox Media you will find the kitchen fully stocked every day with treats and beers. The best part for employees is that this publishing giant receives free food from outside the company. Digiday report that Vox staff have enjoyed Starbucks latte bars, wine tastings and burgers for no cost in the past. BuzzFeed are another publisher that like to keep their employees fed well and often have bagel Fridays and a frozen yoghurt machine. Lesson learned: This is a great opportunity to show you value your employees. Making sure that their mid-morning hunger needs are met by having a stocked fridge will help them focus more on their work and less on their stomachs. Obviously you need to keep to your budget, but even the simplest (and healthiest) of foods can satisfy hungry workers. 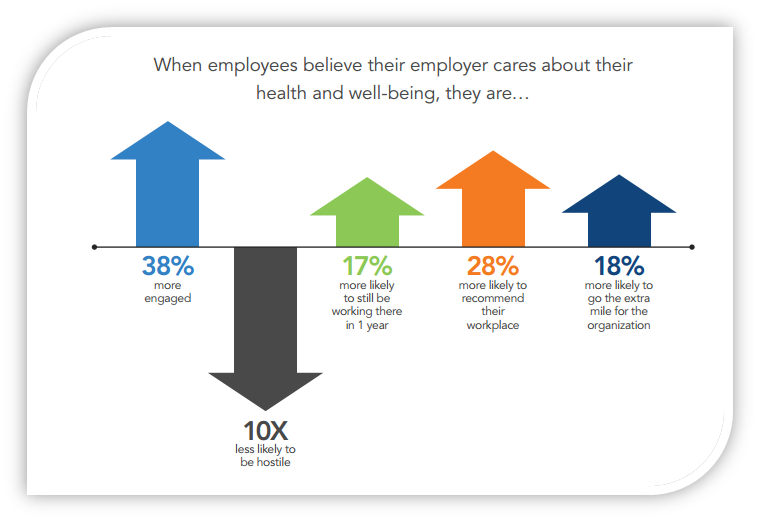 Health is one of the biggest issues that keep employees from working efficiently. Asana has initiated different perks to keep their employees healthy and reduce sick days. Mashable reports that employees at Asana can receive 1:1 yoga sessions and group sessions twice a week. It’s quite logical; the name Asana is derived from Sanskrit as the term for “sit down”. Other companies have realized the importance of maintaining a healthy team, for example Facebook offers excellent health treatments, including on site acupuncture and chiropractor appointments. Lesson learned: Your employee’s health should be at the top of your priority list. Whether it’s finding ways to reduce their stress levels, offering healthy fridge options, or giving them discounted gym memberships can all help to improve your workforce. One of the many worries many women face in the workplace is going on maternity leave. Susan Wojcicki, the CEO of YouTube, told the Wall Street Journal that by increasing the maternity leave from 12 weeks to 18 weeks, meant the amount of women leaving the company reduced by 50%. And in order not to isolate new fathers, the video giant also increased paternity leave from 7 weeks to 12 weeks. The theory behind this approach is really valuable. By keeping the employees you’ve invested in, you are keeping valuable expertise and saving money on staff turnover. Wojcicki also claims that returning parents come back to work with a new perspective that nurtures a more productive attitude to getting things done. Lesson learned: Having a child is an inevitable event that will happen to a lot of your employees. Not all companies can pay for 18 weeks of maternity leave, but smaller businesses can offer unpaid leave without pressure to return to work. I know that many countries have laws that protect mothers, however having an open conversation with expecting parents (both men and women) to put their mind at ease could be the difference between retention and a loss. With the world becoming much more global it makes sense that successful companies are enabling their workforce to work remotely. Not only does this allow them to hire the best people from around the world, it also encourages loyalty and productiveness to the company. Amazon are not the only company employing this approach; Flexjobs released a list of the top 100 companies in 2015 that embrace remote working. They include American Express, Intuit, Nielson and Apple. Lesson learned: Companies that allow flexible working positions for their employees will see that productivity continues and even increases. Especially in positions where a lot of focus is needed, having a quiet place can be much more effective than forcing people to sit in a noisy workspace. Well, we all know how amazing Google’s benefits can be. One of the most impressive approaches they implemented to increasing employee satisfaction is allowing employees 20% of their time (that’s one day) to focus on a side project which differs from their routine tasks. Though there have been some restrictions added (obviously not everyone can have this luxury), some of their best products came out of this strategy; including Gmail and AdSense. They are not the only ones that do this, DropBox also holds a ‘hack week’ every year where employees have the freedom to work on anything they want. Lesson learned: Allow your employees to have a block space of time for innovation. It doesn’t have to be an entire day (I mean that’s not even practical for Google standards), but even one afternoon every two weeks promotes a creative atmosphere where ideas can grow. You can even take inspiration from Zurb, they have created Friday15, a creative challenge database that you can use for free as a way to bond and build trust with each other. For some small businesses making any changes to their work policy seems daunting. Also for veterans in the industry, change seems irrelevant because many have a “if its not broke, don’t fix it” attitude. You can however make small changes that will prevent your employees from burning out and give you the best chance of success and encouraging the development of your company. 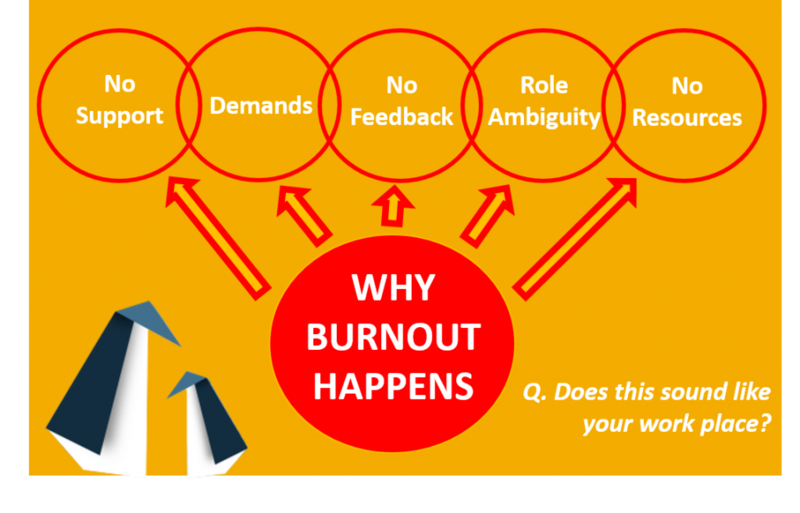 Start with answering these questions: What is your company doing now to make sure your employees are not reaching burnout? What would you like to change to make life better for your staff? Let me know in the comment section below! imonomy is growing at a fast rate, and yet we still feel like a close team. To join our growing family check out our current job opportunities; we’re looking forward to hearing from you!